I would like to assure you that in ALONE, we take a leadership position around transparency and accountability. We have a strong ethos around how we manage money which has been donated. At every level in this organisation, with every policy and procedure, our ethos is turned from words into action. We ensure the best use of all the support we get. Without this support, whether it be time offered, money donated or skills shared it would not be possible for us to continue our work with the 1 in 5 older people most in need. We were founded by volunteers 40 years ago to support older people in need and that is what we continue to do today. Volunteers work in every part of the organisation from the Board to front line services. We respect the generosity and intention of all those who support ALONE because they share our passion to improve the lives of marginalised older people in need. We have been recognised by the 2017 Health Service Executive (HSE) Excellence Awards as an exemplary project improving health and social care services. We comply with the Charities Institutes Ireland Triple Lock Standards, ensuring transparent reporting, good fundraising and governance. We are an Approved Housing Body (AHB). We are a member of the Irish Council for Social Housing (ICSH) and we participate in the HAPM (Housing Association Performance Management) survey. We publish an Annual Report which shows the work we do, the outcomes achieved, and our income and expenditure. Our Board operates to good practice guidelines for governance and has signed up to the Governance Code. Our services are internally and externally audited. Internal audits are carried out at least 3 times per year. Annual external audits are conducted by ISO auditor. We comply with SORP (Statement of Recommended Practice) standards. Our accounts are externally and independently audited. An external evaluation of ALONE’s Befriending service was undertaken and the report published in 2015. ALONE is currently the host of Befriending Network Ireland (BNI). In 2015 ALONE was the lead in the formation of BNI and the Befriending Network Ireland Advisory Group with representatives from the independent befriending organisations across Ireland. In 2016 our Support Coordination service was externally assessed. The report is available here. We are a registered charity – our registered charity number is 20020057. ALONE operates a whistleblowing procedure which can be found here. We do none of these things because we have to but because we know them to be the right things to do. We have seen a dramatic increase in demand for our services in recent times and we envisage that demand will continue to rise in the years ahead. We are confident that we can continue to meet the needs of the 1 in 5 older people who are homeless, socially isolated, living in deprivation or in crisis. We work hard every day to ensure that the vulnerable older people have homes, friendship, comfort, support, security and as much independence as possible. We have doubled in size in the last four years: in that time demand tripled, and the number of volunteers tripled. For me personally, it is a privilege to lead and work in ALONE and in all my actions and decisions, I aim to make the best use of the support we get. Without this support it would not be possible to continue. 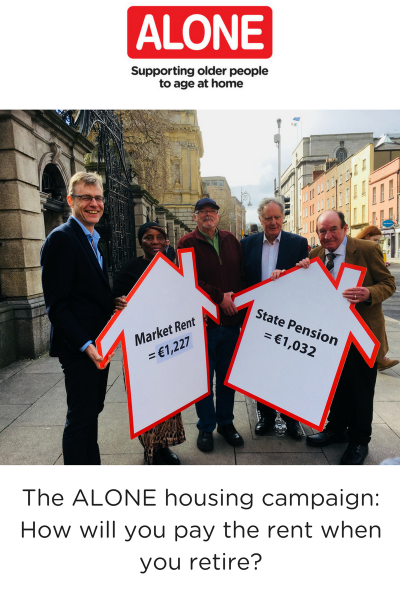 I invite anyone who would like more information or clarification on any of the issues mentioned in this letter, to contact us on hello@alone.ie and we will respond promptly.